We are very excited and honored to announce that His Holiness Dudjom Sangye Pema Shepa -- reincarnation of HH Dudjom Jigdral Yeshi Dorje -- will visit Santa Barbara on June 25, 2018. His Holiness will give empowerment and transmission of the Rigdzin Dupa (The Display of Great Exaltation), a treasure of his previous two incarnations, Dudjom Rinpoche and Dudjom Lingpa. This sadhana is widely practiced in Pemakod, but has not previously been given in this country. This is a rare and precious opportunity to receive this empowerment from the very source of the Dudjom lineage blessings, and to connect with a powerful and authentic great master. BY HIS HOLINESS'S REQUEST, PLEASE DO NOT SHARE THIS VIA SOCIAL MEDIA. You may share this post via email but please do not post or share on Facebook, Twitter, or any other social media site. Thank you. 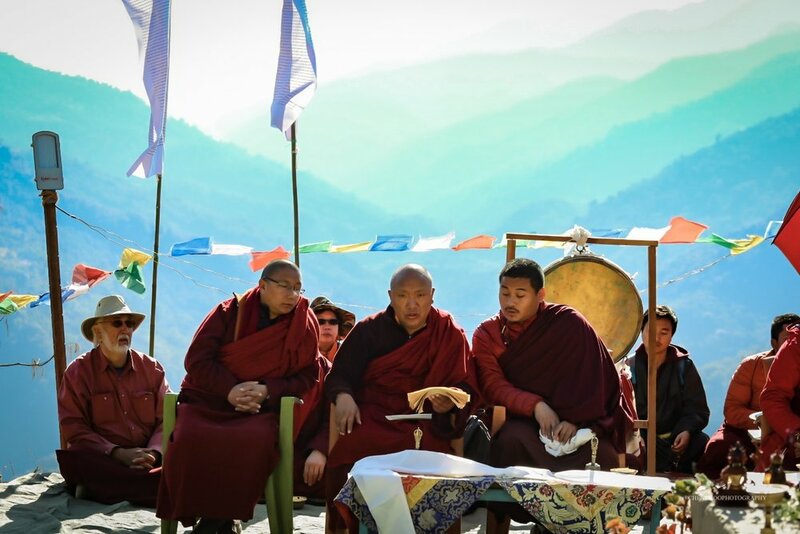 Below you may see pictures of his Eminence Bhakha Rinpoche’s visit to the retreat land and empowerments at the Deden Tashi Choeling, Pemaköd in 2017. 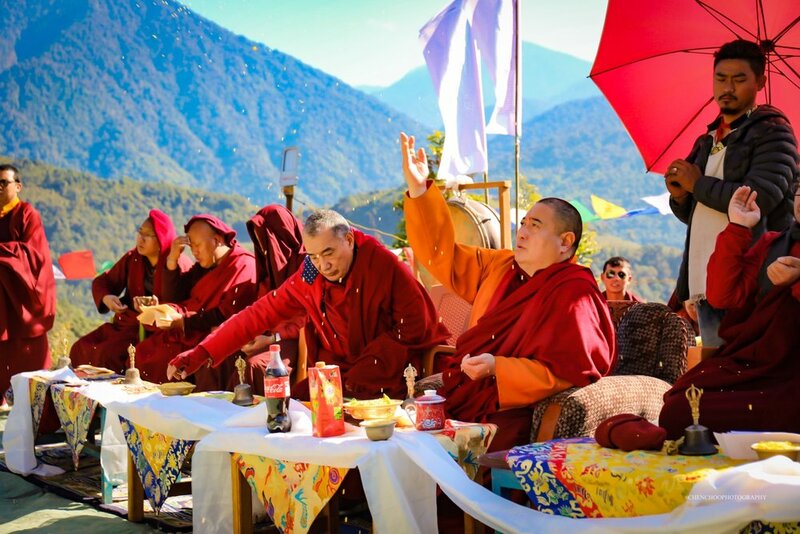 Below you may see pictures of his Eminence Namkha Drimed Rinpoche’s visit to the retreat land and empowerments at the Deden Tahi Choeling, Pemakod in 2018. Upcoming Online Teaching by Tulku Orgyen Rinpoche and other events at Odiyana Institute, please go to odiyanainstitute.org or Odiyana Institute Facebook. Shantideva's classic treatise, the Bodhicaryavatara has been the most widely read, cited, and practiced text in the Indo-Tibetan Buddhist tradition. This precious text has been a primary source in Tibetan Buddhist literature on the cultivation of altruism and the Spirit of Awakening. A six week online course on this text will begin on April 7th. The Odiyana Institute Website is Online Now! This is a screenshot of the new website's homepage. Please follow the link at the top to visit the actual site. Starting in March 2015: Online teachings on the beloved classic text The Words of My Perfect Teacher by Patrul Rinpoche. View the complete flyer here. The Display of Great Exaltation is the Guru Sadhana-Rigdzin Düpa (Assembly of Vidyadharas) of two great treasure revealers, Dudjom Lingpa and His Holiness Dudjom Rinpoche, Jigdral Yeshe Dorje. This Guru Sadhana is contained within the Profound Secret Heart Essence of Dakinis section of the treasure revelation of the great nineteenth-century treasure revealer and Dzogchen master Traktrung Dudjom Lingpa. 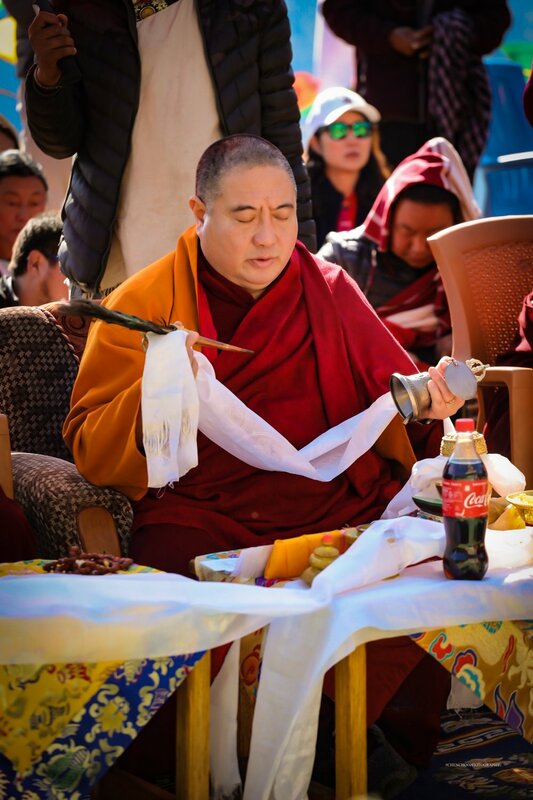 In the treasure revelations of Dujom Lingpa, which are known as "upper treasures" in the Dudjom lineage, this liturgy is the main Guru Sadhana, and is titled Inner-Most Secret Guru Sadhana, the Excellent Treasure Vase of Siddhis. Dudjom Lingpa’s immediate reincarnation, born in Pemaköd, was His Holiness Dudjom Rinpoche Jigdrel Yeshe Dorje, the greatest treasure revealer of the twentieth century. At the age of nineteen, while Dudjom Rinpoche was in Kongpo Drasum in southern Tibet, this treasure guru sadhana of his predecessor was revealed to him as a mind treasure. At this time, many additional aspects of the sadhana, such as the visualization of the eight manifestations of Guru Padmasambhava in the mandala, were also revealed to Dudjom Rinpoche. Dudjom Rinpoche combined these into the comprehensive Guru Sadhana- Rigdzin Düpa, and at that time, retitled it Dechen Namrol, The Display of Great Exaltation. This Guru Sadhana - Rigdzin Düpa in essence combines both treasure teachings, and therefore the blessings of both treasure revelations are ensured through practicing this. The guru mandala of this practice includes the Eight Manifestations of Padmasambhava, something quite unique among the many guru sadhana treasures of the Nyingma lineage. Khorlo Dratsang, the Dharma Wheel Sangha in Tibet, was the main center of yogin practitioners of the Dudjom lineage in Pemaköd. His Holiness Dudjom Rinpoche asked these yogins to observe Guru Rinpoche Day, the 10th day of every month in the Tibetan calendar, with practice of this particular Guru Sadhana - Rigdzin Dupa, The Display of Great Exaltation. Ever since, these yogins and their successors have used this sadhana both to observe the 10th day and for their accumulation of Vajra Guru mantra recitation as part of their Three Roots’ practice in solitary retreat. Viewing this sadhana as having been invested with a share of the blessings of the Dudjom lineage masters for the Dharma Wheel Sangha, all these yogins took its practice to their hearts. After relocating the yogin practitioners to the region in Northeast India known as lower Pemaköd, Tokden Kunzang Longdrol, my predecessor, with much hardship built Deden Tashi Choeling temple as the successor seat of Khorlo Dratsang, the Dharma Wheel Sangha. Additionally, the main object of veneration inside the temple -- a statue of Guru Padmasambhava known as Nangsi Zilnon – was carefully crafted in accordance with the specifications of this sacred sadhana. Thus, Tokden rekindled the lamp of blessings to shine in this time of degeneration in Padmasambhava’s sacred land. From Tokden's time uninterruptedly through today, this sacred sadhana has been practiced in the Temple on every Guru Rinpoche day, just as His Holiness Dudjom Rinpoche once requested his yogin disciples do long ago. All three-year retreatants on the retreat land in Yoldong have been doing their guru mantra accumulation with this sadhana, as was done previously in upper Pemaköd. I have no knowledge of this sacred sadhana being performed anywhere else, at least as of yet. Therefore, taking this as my share of responsibility for and, in a small way, as my humble service to the Dudjom lineage, I have now made this sadhana available to our Vajra brothers and sisters in the West. May this effort be a cause to awaken beings to the state of Vidyadhara Guru in one Mandala. Every year on the 10th day of 11th month of the Tibetan Calendar, sacred dances of the eight manifestations of Guru Rinpoche from the Rigdzin Dupa Sadhana practice are performed at Deden Tashi Choeling. This thangka was commissioned in Bhutan and painted in accordance with the specifications from the visualization of the deity of the Rigdzin Dupa Sadhana. For those who make a $25 donation, this Sadhana will be sent as a thank you gift. We will take care of all domestic shipping costs. If you are interested in receiving this book, please email pkdharmawheel@gmail.com. You can also donate online via our PayPal link below. If you are ordering from outside of the US, postage for many countries is different, so please let us know in your email, and we will let you know how much extra this will cost. Any contributions received in exchange for this sadhana will be used for building a Lama Residence in Pemakod. For the consecration ceremonies in January 2013, we created both a Commemorative Book, entitled “Joyful Feast for the Minds of the Fortunate Ones,” and a Commemorative Pendant. The “Joyful Feast” Commemorative Book contains writings by Lama Rigdzin P'huntsok, Tulku's father and a heart disciple of Togden Kunzang Longdrol and H.H. Dudjom Rinpoche. Included in the book are the biography of Dorje Dragpa (Tulku's great-grandfather and an important historical figure from Pemakod); a Brief History of the Temple; and several other writings about Pemakod and the retreat land. The book is in both Tibetan and English. The Commemorative Pendant has on one side a photo of Guru Rinpoche and on the other side a photo of the completed Deden Tashi Choeling Temple. We are delighted to make these commemorative items available to those who make offering toward the work still underway at the retreat land. If you are interested in receiving one or both of these Commemorative items, please email pkdharmawheel@gmail.com. You can also donate online via our PayPal link below. Be sure to note both your mailing address and which item(s) you wish. We will be periodically updating this page with new information; please visit frequently! "Khorlo Dratsang" -- which can be translated as "Dharma Wheel Sangha" -- was the name of the tantrika sangha in Upper Pemakod. During the golden age of the Dudjom lineage in Pemakod, His Holiness Dudjom Rinpoche, Jigdral Yeshe Dorje, oversaw two sangha communities: (1) the tantrika sangha, called Khorlo Dratsang; and (2) the ordained sangha, called Gelong Dratsang. One time when the great treasure revealer DragNgak Lingpa was visiting the sangha communities, His Holiness -- after much discussion of Guru Padmasambhava's prophecies -- asked the terton about the future of his two sangha communities. After a brief meditation, the terton suddenly clapped his hands and said, "Pemakod became two parts!! There were two birds floating on a vast lake in my vision. The white one remained, while the other one flew off. This means that the tantrika sangha will be very effective in upholding your precious lineage in the future!" Later, His Holiness mentioned this prophecy quite frequently when discussing Pemakod, noting that the great terton's prophecies about Pemakod splitting into two parts, and about the effectiveness of his tantrika sangha, had all come to fruition. The prophecy about the tantrika sangha upholding His Holiness's lineage didn't apply exclusively to Khorlo Dratsang. 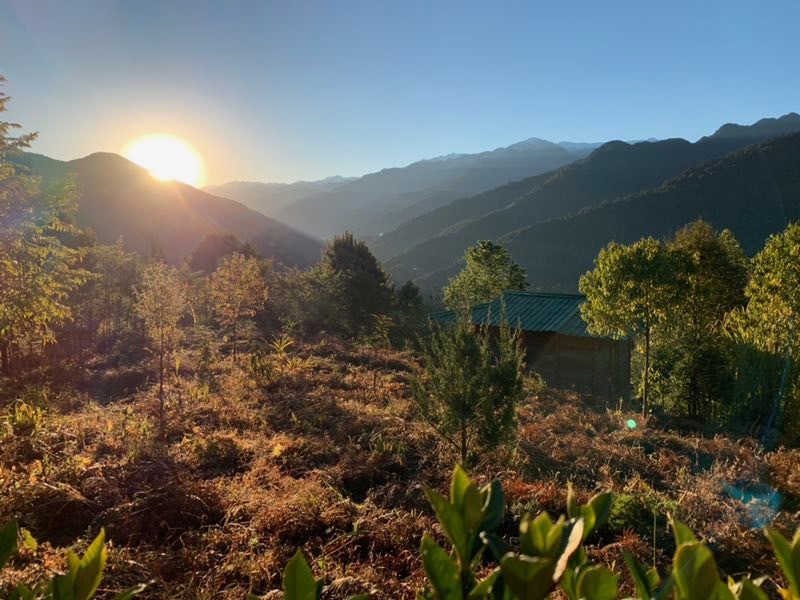 However, there are profound blessings of these prophecies for Deden Tashi Choeling Temple, given that it is regarded as the second seat of the tantrika sangha in Lower Pemakod, India. Today, under the guidance of Lama Rigdzin P'huntsok, this Temple and its activities are dedicated to the preservation of the Dudjom lineage. It is my heartfelt aspiration that we continue to play an important role for the Dudjom lineage in this time and place. With such aspirations, and as an indication of the purpose of this website, we have changed the name of our website from The Pemakod Project to Pemakod Dharma Wheel.